Liza King paints in the detail at the bottom of the lefthand panel. Most of the stained-glass windows we create in our Brattleboro studio are custom architectural designs created in response to the desires of a client and the requirements of a given space. We enjoy the challenge of creating within this structure. Often we take on the role of detectives, trying to ferret out what the client may want, whether or not this is articulated. The nearly completed 3-panel window for Cheshire Medical Center's chapel/meditation space is seen here in the Neumann Studios workshop. It was designed using principles of sacred geometry. In the case of the Cheshire Medical Center chapel window, the client -- a diverse committee from various spiritual persuasions -- already had a clear idea of theme. The committee wanted a spiritual window for the hospital's chapel/meditation area that incorporated iconography without depicting a particular religion. It was important that no one feel excluded by the imagery. 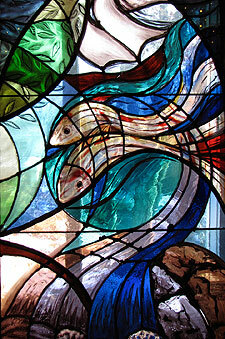 They suggested that the window be based on the four elements: fire, water, air, and earth. For years before we were approached by Cheshire, we had the dream of creating stained-glass windows for a hospital setting. We love the idea of creating public art because it is accessible to people from all walks of life, especially to those who might not be able to afford glass in their homes. A hospital visit can be a very stressful time, and stained glass can provide warmth and healing energy to the visitor or patient. Our meeting with the committee was the first step towards turning our dream and theirs into reality. Our goal was to create a window that would communicate a feeling of well-being to the viewer. The design process began. 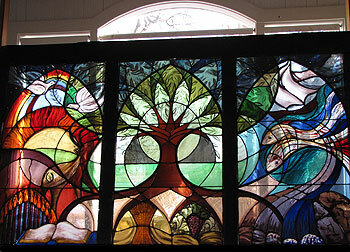 Liza had the image of the Tree of Life as the central window in this three-window installation. She wanted to use sacred geometry to tie the windows together. The elements of fire, water, air, and earth would flow into one another. The lines would be fluid. She created a design (pictured) based on that concept. The committee responded enthusiastically. Traditional stained glass, which involves painting and firing the glass numerous times before it is leaded, is a labor-intensive process. Our next step was to draw up a full-scale ìcartoonî indicating the patterns of glass and the lead lines. Then we immersed ourselves in choosing the glass. We generally use antique mouth-blown glass, the term ìantiqueî referring to the way in which the glass is made. This method -- blowing the glass into a cylinder form, scoring it, reheating it, and forming it into sheets -- dates back over a thousand years. (The glass we purchase is mostly imported from Europe, where there continue to be a number of studios using this method.) For the Cheshire window, we chose some very special glass from a British company no longer in existence. 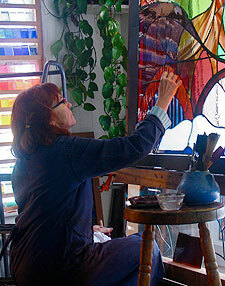 Once the glass is chosen and waxed-up on our glass easel, we paint it with glass-stainer's paints. These earth-toned paints are comprised of pigment and ground glass which fuses when fired and becomes a permanent part of the glass. 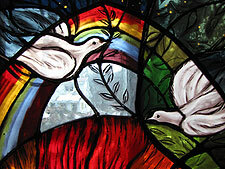 The colors seen in a stained- glass window generally come from the glass itself. The glass paint adds line, texture, and shading. Traditional glass painting is often referred to as painting with light because the process involves the removal of paint where the artist chooses to allow the light to come through the glass. In the Cheshire window, most of the color is in the glass, with the exception of some yellow areas created using silver nitrate, which is also fired in the kiln. During Gallery Walk in February, visitors will see this window in process. All of the paintwork is complete, and Rick is now leading the three window panels. Our goal is to install the window in March, after which there will be an open house at the Cheshire Medical Center to dedicate the new window (date TBA). Our studio, located at 30 Strand Ave., opens early for Gallery Walk -- from 3:00 to 7:00 p.m. -- so that visitors can view the window during daylight hours before it is installed in Keene. We also welcome visits by appointment for anyone who cannot attend Gallery Walk. Please contact us at (802) 251-9901 for information or appointments.